This Heirloom Tomato soup is honestly the best soup I have ever eaten. I kicked your average tomato soup up a notch by adding Heirlooms to the Hothouse Tomato bunch and ended up with an addicting soup that has already got me planning my next batch of it. Soup that you dream about all the next day, knowing it’s in your fridge and just waiting to be dunked into by a rustic grilled cheese sandwich. Heirloom Tomato Soup for Blood Sucking Vampires! Possible toppings: nonfat Greek yogurt, dolloped or put in a pastry bag, fitted with a small, round tip and swirled on; chopped fresh basil, grated cheddar if you are not serving with grilled cheese, grated gruyere on a crouton on top of soup. *Add a few drops of red food coloring if you want your soup “red” for “vampire blood”. For the Soup: Heat the olive oil in a large, heavy-bottomed stock pot over medium-low heat. Add the onions and carrots and saute for about 10 minutes until very tender. You want the onions to be carmelized. Add the garlic and cook for 1 minute. Add the tomatoes, sugar, tomato paste, basil, stock, salt, and pepper and stir well. Bring the soup to a boil, lower the heat, and simmer, uncovered, for 30 to 40 minutes, until the tomatoes begin to break down and are very soft. Add the half and half to the soup, stir and process the soup through a food mill into a bowl, discarding only the dry pulp that’s left. Or if you don’t have a food mill, roll up your sleeves for the following steps: Send it through a blender in small batches. LEAVE THE LITTLE CIRCLE IN THE TOP of your lid open or off and PLACE A CLEAN TOWEL OVER THE HOLE or you will get burned. I have an immersion blender and I just pureed the soup with that. Then push your soup through a large sieve or strainer. This took me a while, like 15 solid minutes of forcing the soup through the strainer but it was SO worth it. Really. 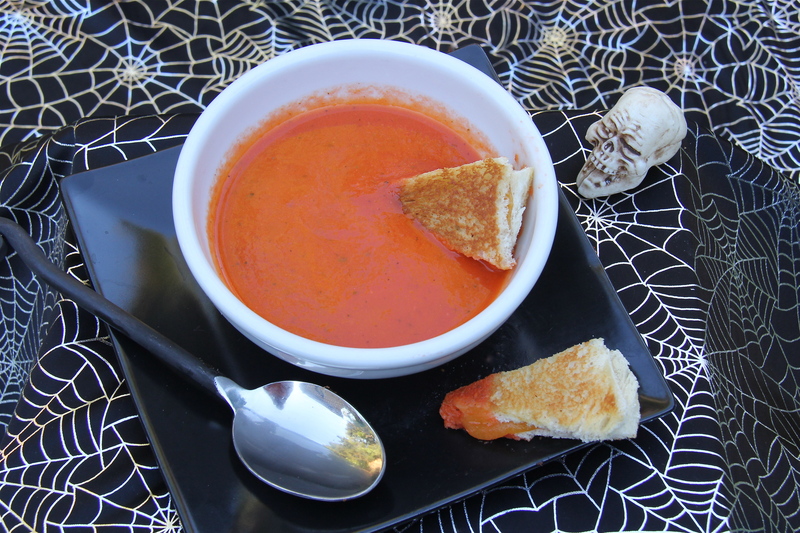 Reheat the soup over low heat just until hot and serve with any of the suggested toppings and a grilled cheese sandwich…cut in tooth shapes if you want it for a Halloween themed dish. Enjoy…I know you will! Categories: Giveaways, Halloween, Soup, Vegetarian | Tags: Fairy Hobmother, Giveaway, Halloween dinner ideas, Halloween party food ideas, heirloom tomato soup, tomato soup, Vampire soup | Permalink. 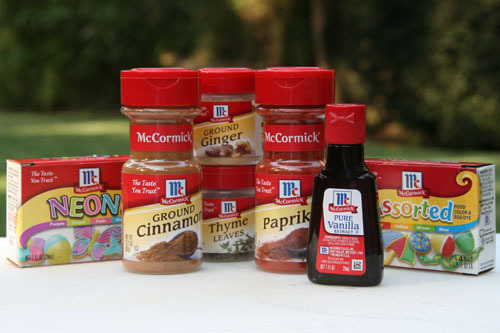 Easter Cut-Out Cookies and a McCormick Give Away! 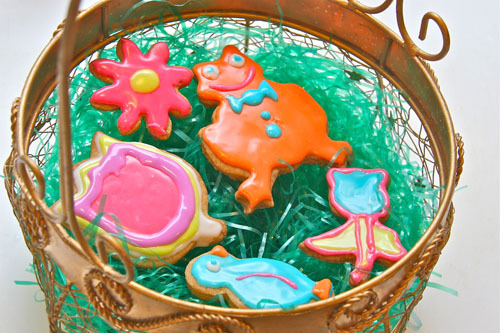 You have officially been invited to my Easter cookie decorating party happening today on Sweet and Crumby. This is a virtual decorating party, so please use your imagination and jump right in. Categories: Cookies, Giveaways | Tags: Easter cookies, Easter Cut-out Cookies, McCormick cookie recipe, McCormick Give Away, roll-out cookies, spice cut-out cookies | Permalink.